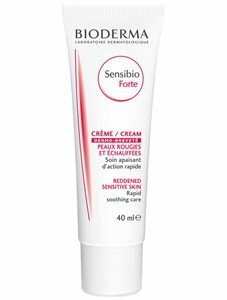 Sensibio Forte, restructures the skin's protective barrier and provides long-lasting comfort. An emergency, anti-inflammatory care, to use in cases of erythema, post-laser, post-depilation, post-shaving, scalding, or crises of allergy or hypersensitivity. Rich in soothing and anti-inflammatory agents (Rhamnose, Enoxolona), care Sensibio Forte cream, prevents the increase of inflammatory reaction, reducing redness and heating sensation. Moisturizing agents, fight against skin dryness that often accompanies the state of irritation. Apply in crises of redness or strong heat, 2 to 3 times a day on clean skin, preferably with the Sensibio H2O. How to register improvements in skin, space the application of Sensibio Forte, and continues the application of Sensibio AR. Suitable for women, men and children.